Dyed in VT Tie-dye Gallery, Music Room. Photo Gallery, many tye-dye exhibits. What better way to start the music room than this picture of Dan The Guitar Man. 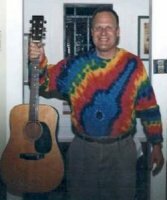 Noone is prouder of his guitar, and of his guitar tie-dye than he.